Among the windows made originally for the cathedral are several in the choir chapels, a large cycle of kings in the clerestory and several in the north nave aisle. 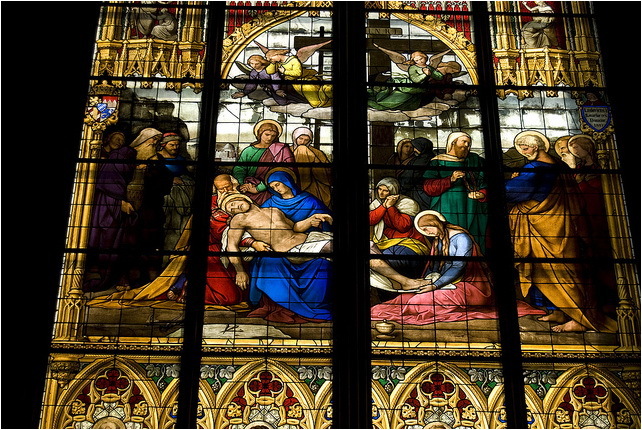 Original glass, notably from the triforium and choir chapels, was removed in the 18th century in the course of a redecoration program that replaced colored windows with white glass. The five windows of the original south aisle of the nave were also removed at an unknown date. 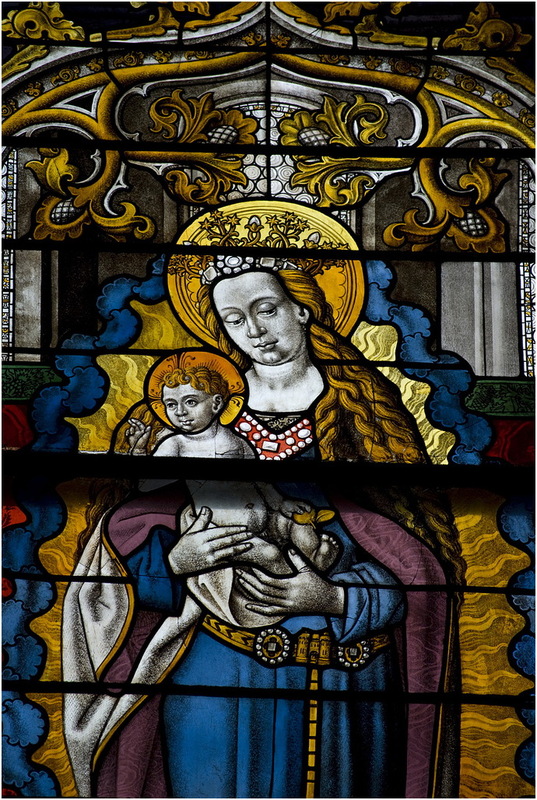 With the renewed interest in Gothic art during the 19th century, medieval glass from several secularized Cologne parish and monastic churches was incorporated into the glazing of the cathedral, mainly in the north transept and sacristy. The original decor can be partially reconstructed with the help of drawings made by Sulpiz Boisserée. The burial of Archbishop Konrad von Hochstaden in the axial chapel in 1261 or shortly after gives an approximate date for the ‘Bible window’ there. In many windows coats of arms help both to identify their patron and to date the glass: for example, the arms of Heinrich von Virneburg in the cycle of kings in the clerestory help to date them to his archiepiscopate between 1304 – 1332. Documents provide precise dates and names of the patrons of the five north transept windows. Among the early glass the two ‘Bible windows’ are particularly important. The one in the axial chapel of the Three Kings is the oldest glass in the cathedral, and the earliest preserved ‘Bible window’ in Germany. The second, originally from the Dominican church and now in the St Stephen Chapel, reflects the influence of French court painting. 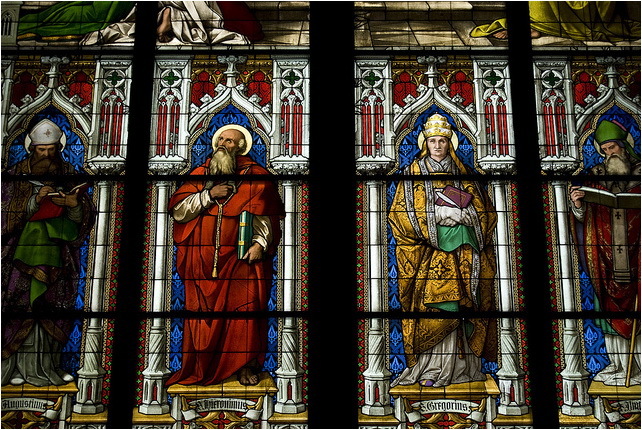 The most important of the later windows have been associated with such well-known Cologne artists as the Master of St Veronica, the Master of the Holy Kinship, the Master of St Severin, Bartholomäus Bruyn the elder and those of the school of Stefan Lochner. It is widely assumed that this later glass was designed by one artist and executed by others, so that the famous Cologne painters themselves may have been responsible for some of the designs. The comprehensive iconographic program has been interpreted somewhat controversially by Rode as representing the History of Salvation, depicted typologically with themes representing the three periods of history. Thus the period ante legem is represented by Christ’s genealogy, as seen in the kings of the clerestory windows; the period sub lege is depicted in the axial chapel of the choir in scenes of Christ’s life; and the period sub gratia is depicted in the other choir chapels, in scenes from the lives of saints.